Happy weekend my friends! I’m helping my best friend plan her daughter’s baby shower this Sunday! We have been having the best time! I’ll be sharing some of the DIY’s that I’m contributing next week! Today I’m here to share A Few of My Favorite Things-10-8-16. I try to share a variety of things with you – from decorating ideas, DIY projects, recipes, and this week – a great giveaway! Enjoy! As always, click the bold title under each picture to visit the blog featured and pin from there! Thank you! I’ve been looking at sconces recently for my living room. 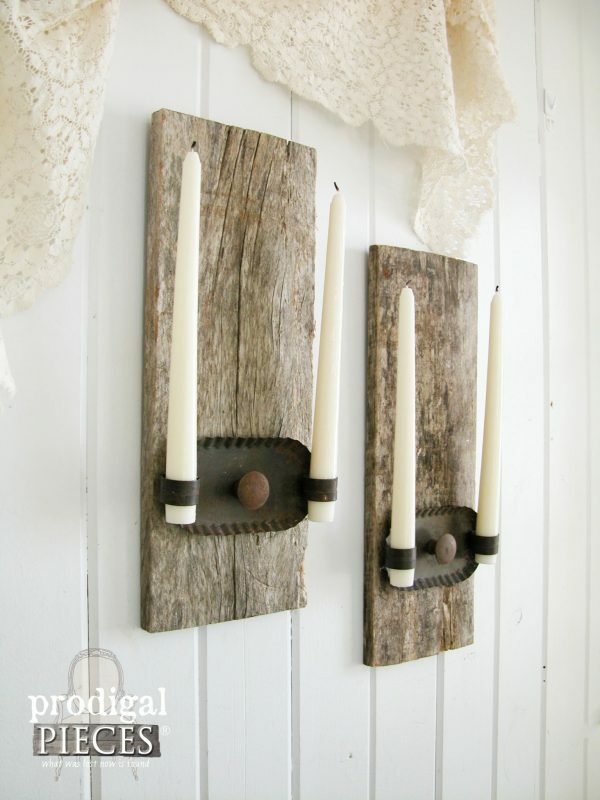 I happened upon these beauties that my friend Larissa at Prodigal Pieces made from old barn wood! She is so creative and brings life back to things people throw away! 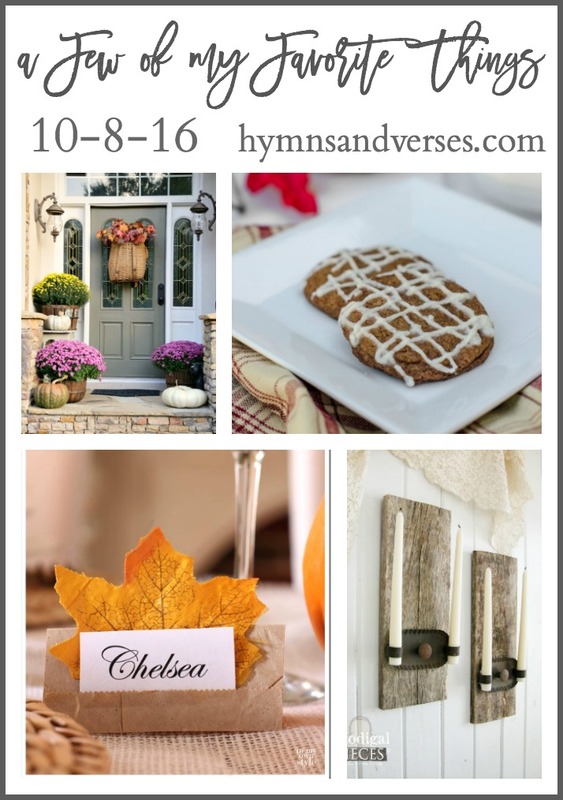 I love everything about this pretty Fall front porch from Kim at Savvy Southern Style. 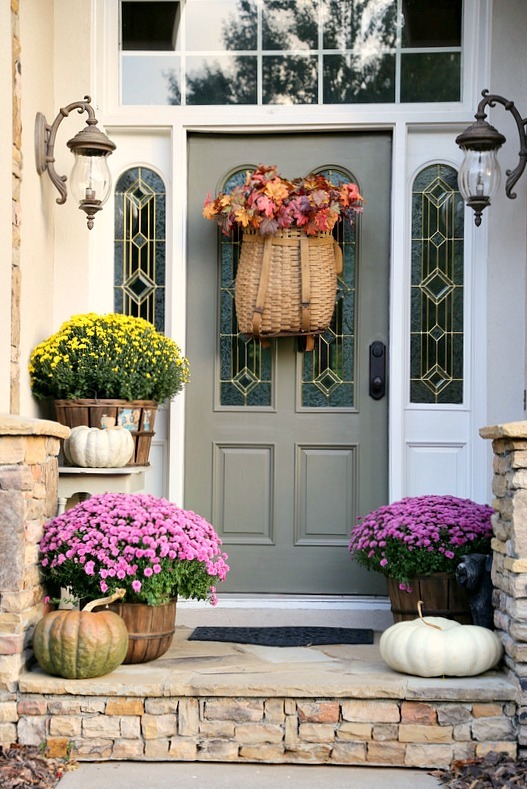 Those purple and yellow mums, pumpkins, and vintage trapper’s basket of leaves are perfect against the backdrop of the gray front door. And, those sconces – amazing! 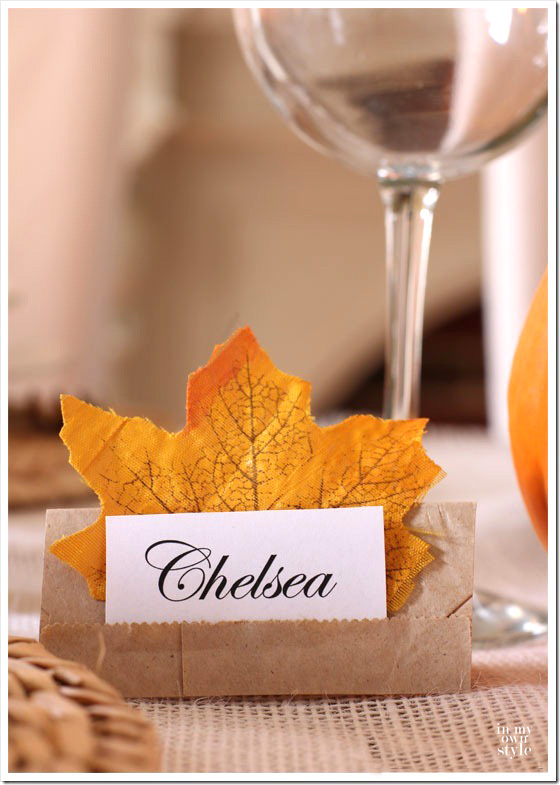 Diane from In My Own Style shared this clever way to make place cards for your Thanksgiving table with brown paper lunch bags! Aren’t they pretty! These gingersnaps with apple cider glaze from Jamie at Anderson and Grant look so good! I have to give them a try! 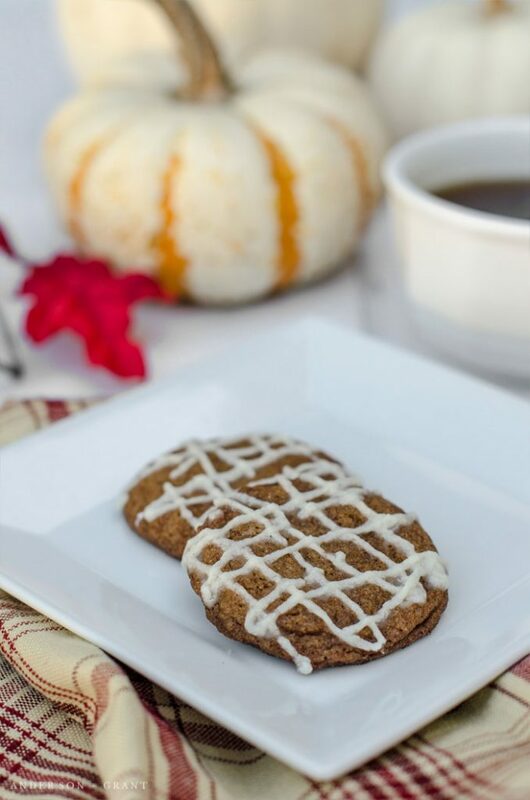 What a perfect treat for the Fall season! 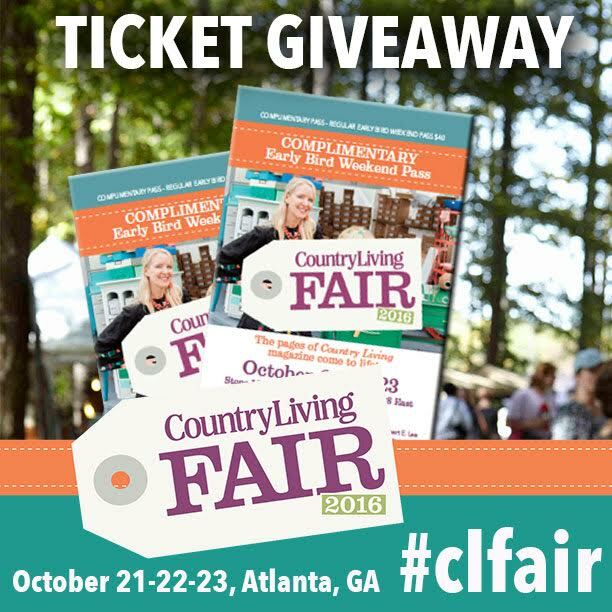 My friend, Debbie, at Refresh Restyle is giving away two tickets to the Country Living Fair, October 21, 22, 23 in Atlanta, GA. Even though I don’t live close to Atlanta, what a fun weekend getaway it would be! I’ve entered! If you live within driving distance to Atlanta, you should stop over and enter for a chance to win these tickets! Thanks for stopping by today! Enjoy the rest of your weekend! If you live in the path of Matthew, I pray you are safe and your home is secure! Doreen, you are so sweet to feature my front porch that I literally threw together. I’m offering CLF tickets, too on the blog if anyone wants to increase their chances of winning. Have a wonderful weekend! What a fabulous collection, Doreen. I am tickled that you included my candle sconces. Thank you!